TU20 came out about a week ago and no we’re not doing that stupid song again, but what normally happens after a big update comes out is that a few weeks after that update comes out another update comes out which includes a lot of bug fixes, and after this update a bigger update comes out including new stuff. TU20 was this bug fix update and fixed a lot of problems that were caused by TU19, but apperently this update wasn’t enough to fix all the problems. 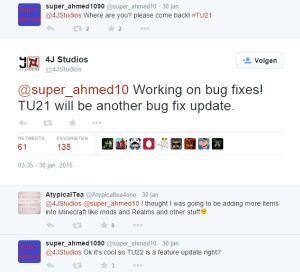 This is pretty dissapointing, but TU21 will be yet again a bug fix update because 4jStudios Tweeted to super_ahmed10 that they are working on bug fixes! 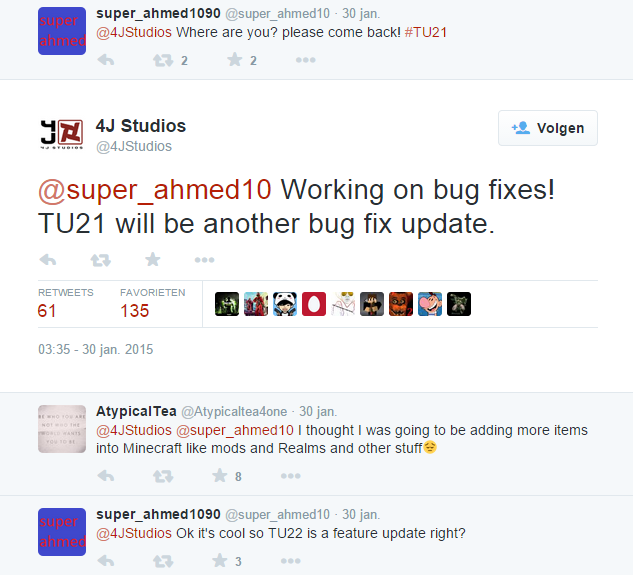 TU21 will be another bug fix update. Hopefully TU22 will be the next big update but all that we do know now is that TU21 won’t be this update and that this update will contain again fixes.